What are some of the main issues faced while changing diapers? First and foremost, you need an adequate place for changing diapers to avoid creating a mess around the house or inside the bathrooms. Furthermore, you are looking for storage space close to the changing station in order to keep the diaper-changing essentials within reach. You can’t be running around looking for wipes or diapers while the baby remains unattended at the changing station, can you? This is where the Just One Year changing table comes in. Maximum Weight Capacity: 30.0 Lb. This Just One Year changing table is perfect for allowing a quick and uncluttered diaper changing experience to all parents alike. Check out our changing table buying guide for a bunch of similar changing tables and a whole lot of different ones. If you’re looking for something that’s a lot more spacious, the Jonti-Craft 12-Tub changing table may be a good alternative. As you can see from the picture, this changing table has a changing pad on top, and the two shelves right below the top are to be used for keeping the baby diaper-changing essentials all in one place. You can keep the wipes, diapers, baby powder, lotions and anything and everything you will need at the time. The table has been designed to hold a maximum weight of 30 pounds, making it a durable choice for the nursery. When your first 1-year-old grows out of their diaper changing years, you can use the table for the next one. The table comes with a wooden frame and has been manufactured with the help of wood with a veneer white finish. 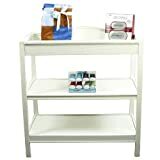 This is a simple diaper-changing table that you can keep in your child’s nursery without having to run around looking for the right place with all the essentials kept within reach.